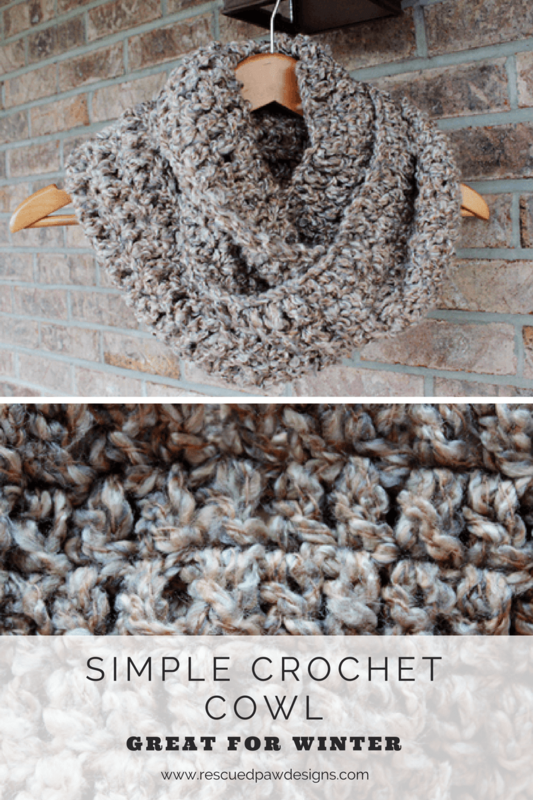 This easy crochet infinity scarf pattern for beginners is the perfect quick pattern to make today! I somehow found time between all the Christmas parties, cookies and present opening to design this simple crochet scarf pattern and I love how it turned out! 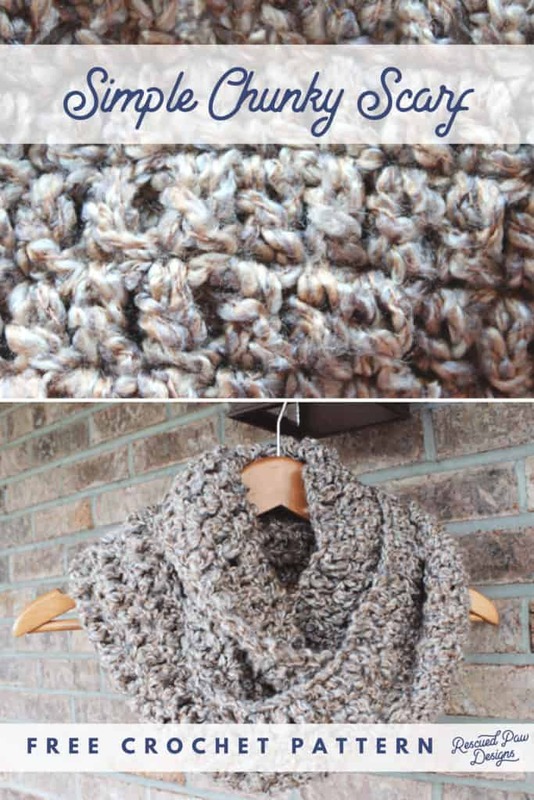 🙂 Read on down to find the full FREE Crochet scarf pattern for beginners to get started today! I used Loops & Threads® Country Loom™ Yarn from Michaels in shale. This was my first time using this bulky yarn and I have to say I really loved it. It is super soft and the shale color is so beautiful with its mixture of gray, brown and tan tones. You only need less than 2 skeins of this yarn and the color combinations are endless because of the great variety that Michaels carries. If you can’t find this yarn Lion Brand Homespun is a great alternative! I decided to use a simple double crochet stitch for this entire pattern so it would be perfect for beginner crocheters. It really is a quick one hour project! 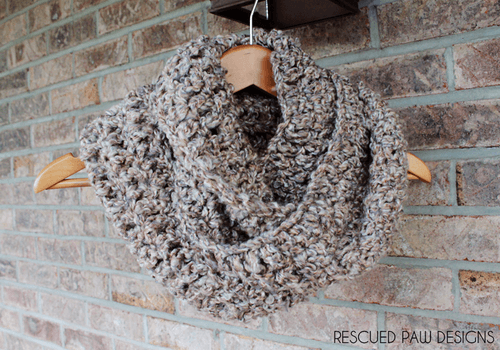 Please read on down for the full free, simple crochet scarf pattern. Finished dimension is approximately a 60″ circumference and 8″ width. Finishing: Fasten off and weave in loose ends with yarn needle. Wasn’t that simple? I love quick and easy projects! 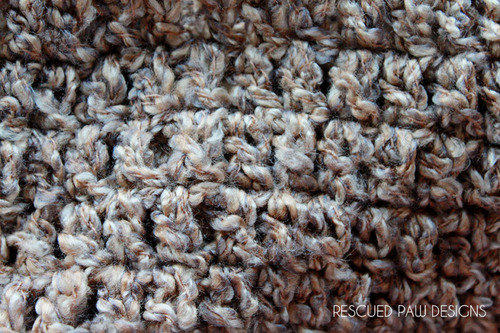 If you make this simple crochet scarf please share it with me on Instagram @rescuedpawdesigns with the #rescuedpawdesigns. PS: Want to Stay Connected? Join me on Facebook or Pinterest. Thanks, Krista! I just continued…..I REALLY wanted to assess how it turned out. So fun – great pattern!! NOW I have a “mobius simple double crochet scarf”!! Hehehe! You are welcome! 🙂 Glad it turned out! Krista, can this be started with a foundation double crochet? Also I would like to make it 16″ wide. Which hook size do you recommend, you mention 9mm N (a 9 mm hook is M, a 10 mm hook is N)? 9 mm can be marked M & N it all depends on the brand. Hope this helps. If I want to make this bigger just add more chains to the foundation row? Is there a multiple number I need to use? Love the color! You are correct! Just add any amount of chains. Hope this helps. hi, just wondering if it uses exactly 208yards as the wool I’d like to use comes in skiens of 88yards. thanks! It is a little less than 208 yards but I am not sure exactly how much since it has been awhile since I made this. 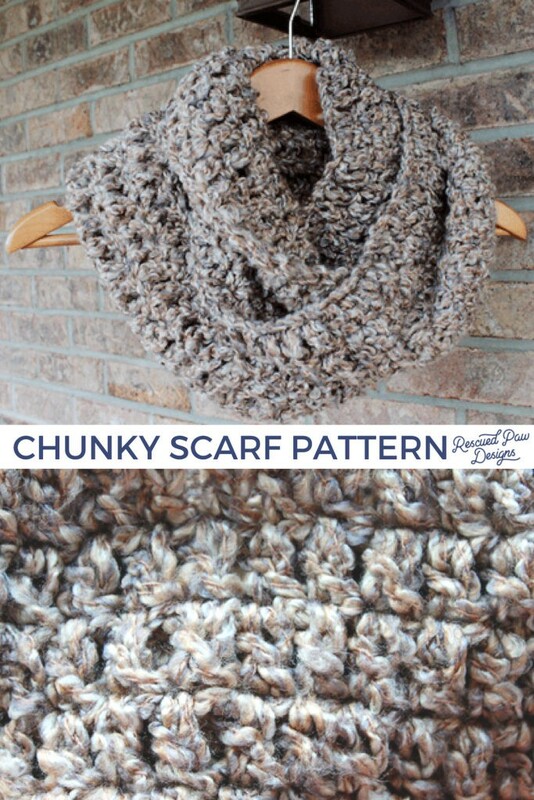 Can I make this with a bulky yarn instead of super bulky?